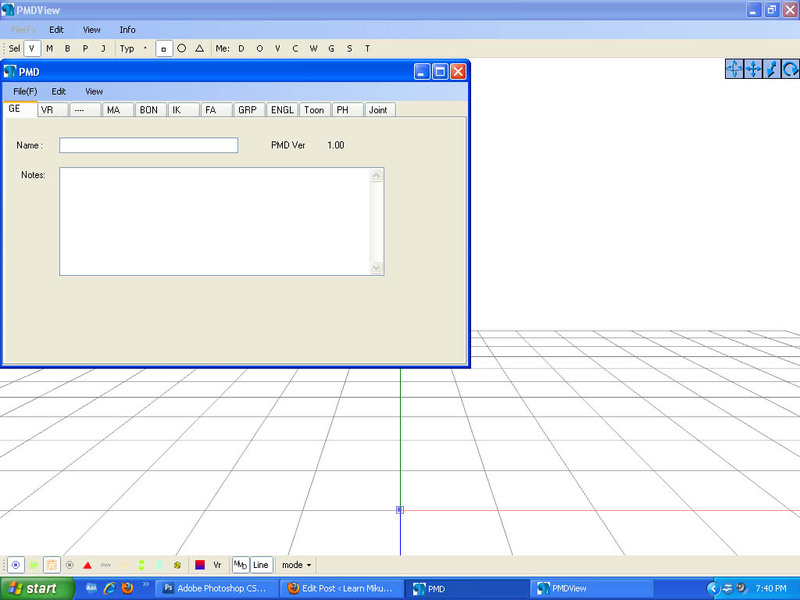 PMD Editor Basics, now in English - Modify Your MMD Models! 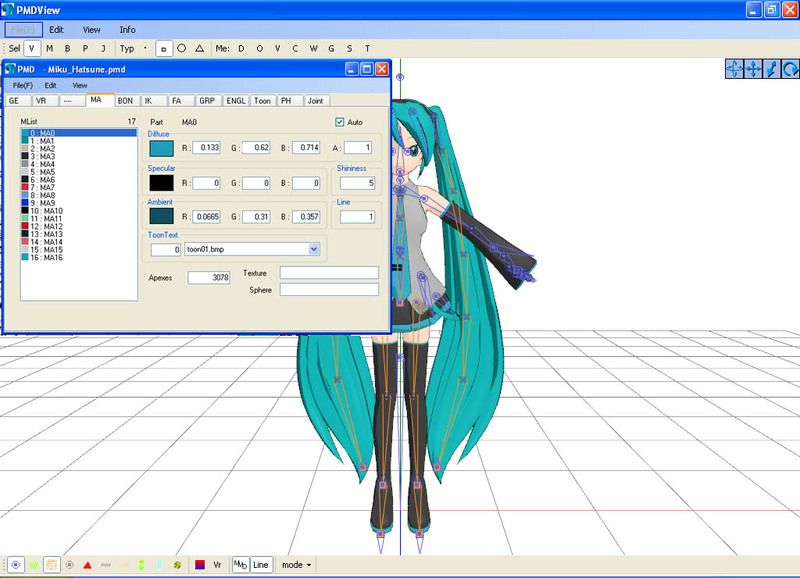 MikuMikuDance How can I change the color of my models? How can I edit my models in MMD? Is there a tutorial for PMD Editor PMDE available in English? Download PMX / PMD Editor! This is a new link, new to LearnMMD as of 2/14/2014. It’s a PMX / PMD Editor in English. Visit ibozo’s dA page by following that link! When you first open PMD Editor, you’ll no doubt see something like this. This may seem a bit confusing and intimidating to a newbie. Sure, there are a lot of things that are just like MMD. There is a bone in the middle (Which is always there for some reason), and our good friend, the coordinate axis. There’s also the camera control buttons in the upper right corner, just like in MMD. it couldn’t possibly all fit! So the creative geniuses (Whoever they may be; I wish I knew…) behind PMDE came up with a unique solution: The tabs. For this project, all we will need is the materials tab. We will be recoloring a model, the most basic of all edits. Now, I won’t lie to you; If you’re like me, someday you’ll look at this model and cringe in horror. “Oh god! Why would I make such a horrible edit? Only noobs do that! My latest models are sooo much better!” Well, don’t get discouraged! I started out doing recolors too, much as I may hate to admit it. ^_^’ Even if they’re not as fancy as Gijinshi-san or Nanami-san’s models, you’re not going to get anywhere if you don’t learn, and the first step of learning is recoloring. If you do this, you’ll have started on your way to becoming a great modeler. Someday you’ll be amazing. Don’t give up! EDITOR’S NOTE: While it is easy to make changes to your model, the creator of your model may have requested restrictions on the copying, modifying, and redistribution of his artistic creation. See the READ ME document included with most models to see if the author has asked for you to respect him in these ways. If you modify a model for your amusement, you may use it in a video, but do not share it or make the link available online unless you know, for certain, that you have the permission to do so. See this link for the MMD Rules of Etiquette. Specular is basically the color light reflects as. This is generally set to some shade of black. It won’t make much of a noticeable difference in PMDE, but if you change it, you’ll be able to see it in MMD. If you look, you’ll also notice fields with numbers next to each color type. These affect different qualities of the material. Next to the diffuse is A, or alpha. This changes the transparency. This can be anywhere between 0 and 1. Next to the specular is shininess, which is rather self-explanitory. The higher the number, the higher the shiny. Shiiiiny… 8D This won’t make much of a difference unless the specular is a light color. Finally, next to the ambient we have line, which decides whether or not the part will have an edge line. It can be either 0 or 1. 0 is no edge line, 1 is edge line. That’s pretty much everything you need to know to make your very first model, a simple recolor. ^_^ Play around with these settings, and see what you can do! And remember, don’t be afraid to experiment on your own. Explore the rest of PMDE! See all of the MikuMikuDance tutorials available on LearnMMD.com. See the List of MMD Tutorials on the LearnMMD homepage. Learn more! There’s no limit to what you can do. Still running MMD 7.39? … ? … maybe one of those will work for you. You need a version of the MME plugin that is compatible with MMD 7.39 – that could be hard to find these days. The better option is to upgrade your version of MMD to the latest version. Plus also note that many contemporary MMEs do not work with MMD 7.39 even if you got the MME plugin to work. Permission to do a model granted. So, what happens when you try to open PMDE? … error message… anything? how to make a mmd? I can’t download it. Please help. We do not host PMDE directly… if you go to our Downloads page, though, you will find links to DeviantArt pages that do. Just click on pictures. Why can’t you download it… what happens?